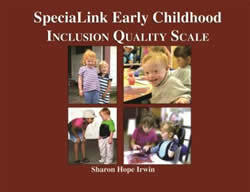 The SpeciaLink Early Childhood Inclusion Quality Scale (2009), by Dr. Sharon Hope Irwin. Assessing Inclusion Quality in Early Learning and Child Care In Canada with the SpeciaLink Child Care Inclusion Practices Profile and Principles Scale. [PDF 64pp 600KB]. A report prepared for the Canadian Council on Learning. by Donna S. Lero, Ph.D., Jarislowsky Chair in Families and Work Centre for Families, Work and Well-Being, University of Guelph, February, 2010. "Disability and Inclusion: changing attitudes-changing policy"
This chapter by Debra Mayer appears in the recently published Beyond Child’s Play: Caring for and educating young children in Canada Our Schools/ Our Selves, Spring 2009 (vol. 18, no. 3, #95) published by the Canadian Centre for Policy Alternatives, Ottawa. "As we move towards the end of the first decade of the 21 st century, Canadian families continue to be stymied by the lack of a national early learning and care system, and policy makers continue to be confounded by the concept of a “rights based” rationale for children’s entitlement to early learning services separate from their parents employment status." Read the full chapter: Disability and Inclusion: changing attitudes-changing policy [PDF 7pp 82KB]. If you have not yet taken part in our inclusion training, please visit SpeciaLink on the Road, to find out where we are offering training next. © 2004-2019 SpeciaLink. All rights reserved. SpeciaLink puts researchers, policy makers, parents, early childhood educators and directors in touch with the best inclusive practices on the frontlines of Canadian child care. SpeciaLink's goal is to expand the quality and quantity of opportunities for inclusion in child care, recreation, education, and other community settings, to young children with special needs and their families. Our findings are available to EVERYONE.